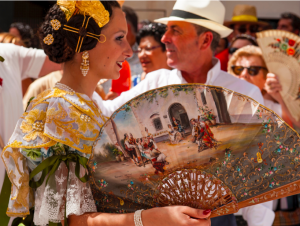 Valencia is not only the capital of the Valencian Community but also one of the most important cities in Spain due to its commercial and agricultural potencial, which can only be compared to its beauty and its important touristic appeal. Without a doubt, its most visited spot is the City of Arts and Sciences, which is located just some minutes away from the Valencian coast. It is also widely known for its gastronomy, which includes typical Spanish dishes such as the paella and the fideúa. A city full of charm and tradition that culminate with festivities such as the fallas (which take place in march) that you certainly cannot miss. Let’s begin our visit in Valencia! Right after settling down in Valencia, I headed to one of the stop that I was yearning the most, the Institute of Modern Art of Valencia (also known as the IVAM), which was the first centre of this kind of art in the country. For the lovers of this type of art, it will probably also be one of your first stops in the city and I can assure you you won’t be disappointed. The two main artists of the exposition are the Spanish sculptor Julio González and the painter Ignacio Pinazo. Without a doubt, a highly recommended stop for all those who want to take advantage of the opportunity to see some of the best pieces of art of these two artists among others. After my long visit in the galleries of this art institute, I went to another museum worthy to be visited, the Prehistoric Museum of Valencia, which is located some minutes away from the IVAM. In it, you will not only be able to see antiquities but also, interact with them, which will allow you to transport yourself to the prehistoric era, before the emergence of the first handwritten pieces. For those that are highly interested in this era and history in general, they also have the chance to go visit some fields that have been conserved so that visitors have the opportunity to see how people lived more than two thousand years ago. Additionally, for the youngest visitors, during the weekends there are some activities that aim to encourage children to learn about this era and start being interested by history. The day was coming to an end and after the trip and all the visits, I decided to go rest in order to be full of energy to go through the most important spots in Valencia the next day. The sun rises in Valencia and nor the willingness nor the energy lack in me to continue my visit through the main streets of the city. I started in the Palau de l’Almirall, a great example of a house of the upper class of the XIIth century, during the medieval era. It is one of the best hidden treasures of the city, which most of the visitors are not aware of. In this palace, you will be able to visit its interiors and its rooms, as well as the turkish bath dated of the XIVth century, which constitutes a very interesting stop in your tour around the heart of the city. 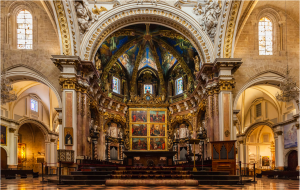 About three minutes away from the Palace, you will find the Cathedral of Valencia. There, you will be stunned by its external structure, but it is not this outside perspective the one that should strike you the most. In fact, the greatest enchantments of the cathedral are found in its interior. One of its biggest treasures is the Miguelete, a tower from which you will be able to enjoy spectacular views of the city. A view you certainly cannot miss. Additionally, the interior of the cathedral is also incomparable. Especially, what fascinated me the most was the major chapel of the cathedral (do not forget to look up in order to admire the amazing paintings that decorate the vault). To make sure that you do not miss any spot of the cathedral, you can also book a guided tour during which you will be explained all the origins, symbols and secrets that the cathedral holds. A very recommended option for the most curious travellers! 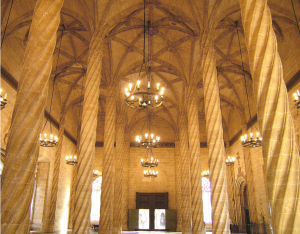 Just some minutes away from the cathedral, you will find the Llotja de la Seda, which is located in the historical centre of the city and was declared as World Heritage Site by the UNESCO. It is one of the principal gothic symbols in Europe (and even worldwide) due to its rectangular structure, its interior and its statues among other aspects. Without a doubt, one of the most visited places in the city that you just cannot ignore. After my visit around the centre of the city, I decided to take a well deserved break to enjoy one of the most typical dishes in the country and especially of the region, the paella. Truth be told, the paella you eat in Valencia cannot be compared to the one you can eat anywhere else in the country. Personally (and for most people), the one I recommend the most is the paella de marisco, which will leave you with a very good taste of mouth with its mediterranean flavour that will allow you to resume the day with energy. 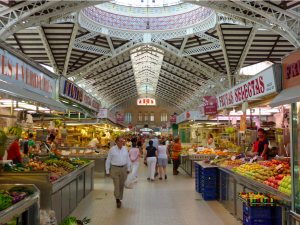 Right where I was, next to the Llotja de la Seda, you will find the central market of Valencia, which despite its name, is much more than just a regular market. It is in fact an impressive historic market with a structure and decoration worth admiring, especially its lightness due to its open windows and its vault, in which you can also purchase all kinds of food and products. My last stop of the day was in the Serrano towers, which are located about ten minutes away by walk from the market, passing by the San Bartolomé tower. Small cultural fact: this wall and towers were constructed in the XIVth century, during the medieval time, and constituted the northern entrance to the city before its further expansion. It is one of the commercial and historic symbols of the city that you must visit! 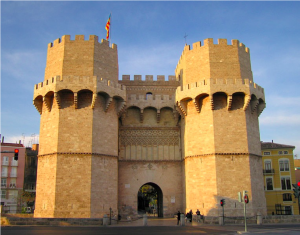 It is composed in its interior with galleries that you can visit as well as a terrace in the upper part of the tower. The sun started to set in Valencia, but the day was not yet over. In fact, the nightlife of the Valencian capital had just started and it was the moment to enjoy the funnest side of the city. Valencia is a city with a great night atmosphere, with numerous clubs in which you will be able to enjoy of great music and an even better atmosphere. For those who want to live an unforgettable experience, I highly recommend going to La Marina Beach Club, without a doubt, the most chic place in Valencia where you can enjoy shows, music and much more! My last day in Valencia had come and it was about time to go to the last places in Valencia that I wanted to visit, which were also some of the most famous places in the city that I was more yearning for: the City of Arts and Sciences, the Oceanogràfic and the Hemispheric. Simply some unique visits that you must make before leaving the city! However, it is important to bear in mind that you need at least one entire day to be able to visit them well, without the rush and be able to enjoy every aspect of these centres. 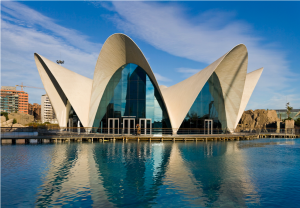 The City of Arts and Sciences and the Hemispheric make up much more than just a museum since you will be able to make some experiments yourself, interact with the expositions, and find out a lot of new things thanks to its numerous interactive activities that the museum holds. A much more attractive and fun museum, adapted to all ages. The Oceanogràfic will also take your breath away. A spectacular park in which you will be able to see all types of animals, from sea lions to penguins, sharks and crocodiles. Furthermore, you will have the opportunity to live and unforgettable experience spending the night in the Oceanogràfic in the shark tank. And for the most bold visitors, you can also swim with these incredible creatures. You cannot miss this opportunity! However, it is important that you bear in mind that these visits have a very high demand, which makes it essential for you to get your tickets in advance thanks to your portable wifi device in order to be able to enjoy this experience to the fullest. Valencias has been an unforgettable journey. One of the main cities in the country in both cultural and commercial levels that is definitely worth visiting. Additionally, if you go during the month of march, you will be able to enjoy some of the most famous festivities in the country, the fallas. 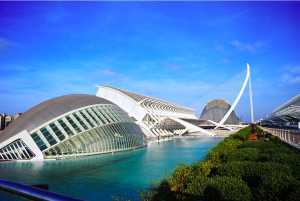 For the lucky visitors that are able to enjoy more days in Valencia, some highly recommended visits include La Albufera, the bio park and the Museum of Science Principe Felipe. Enjoy your trip to the fullest, enjoying all the advantages of travelling connected to the Internet thanks to your Portable Wifi Spain device!